Wi-Fi connected desk clock with RGB panel, controls IR and Wi-Fi based switches to control AC appliance via IR or Internet to save power. Smart Wi-Fi connected Desk Clock which includes a RGB panel and a IR Blaster is a multipurpose IoT device built using ESP8266 interfaced with the Infineon’s DPS310 which is a miniaturized digital barometric pressure sensor that offers high accuracy, low current consumption, and Infineon's BGT24LTR11N16 24GHz Radar with smart motion tracking, direction, proximity and speed detection capability. As the name says the device shows time and date on a 1.3" OLED display interfaced with it, the device includes a 4x4 WS2812B RGB LED panel and an IR LED interfaced with the ESP8266 which helps us control devices which can be controlled using an IR remote control. The prototype connects to internet via Wi-Fi to receive and send commands using MQTT protocol through Internet to communicate with the Mobile App and other IoT devices like Wi-Fi AC Appliance Switches. In the android app, whenever you press the buttons to select the mode, it will publish the command in the HacksterProjectRx topic to set the selected mode on the device and when it receives the acknowledgement in the HacksterProjectTx topic from the device it will alert saying that the mode has been set. Similarly, when it receives the Intrusion alert message in the HacksterProjectTx topic from the device it will give a push notification. As you can see in the above video android app helps us set the device at different modes of operation for different use cases of the device based on where you want to use it, which are discussed below. Each of this mode is explained in detail below with separate videos for better understanding. Office cabin and home office rooms generally have an air conditioner and lighting systems. Some even have a lavatory that can be accessed from the main cabin. It has become a human tendency nowadays that we hardly take time to switch off these AC appliances while leaving the cabin/room. The desk clock helps us in doing this by triggering the IR based AC wall switches, Air Conditioner through IR Signals and Internet connected switches over MQTT. Based on Open and Close Events of Main Door / Lavatory Door of the Cabin detected by the Infineon’s DPS310 pressure sensor and smart motion detection by Infineon's BGT24LTR11N16 24GHz Radar helps us to write an algorithm on the ESP8266 for turning on and turning off the light, fan and air conditioner of the room when the room is occupied and unoccupied respectively to save power usage. With living room, bedroom, kitchen, water closet and so on in a typical household, the living room is the most commonly used space until we go to bed. Say we usually spend our family time together in the evening from 6-10, and it's obvious that we tend to move to a room or the other to grab something when required. We generally tend to keep the doors open and again, even in this case we ignore to switch off the lights while moving out of the room. Using the Infineon's BGT24LTR11N16 24GHz Radar we can detect the motion of someone approaching towards the Radar continuously for a particular period of time and also with the amplitude of the signal the lights are turned on. Likewise the lights are turned off when the the person is departing away from the room. Note: When a PIR sensor is used to control the lights automatically based on motion detection, we get false detection when someone moved across the door and didn't enter the room, you can note this in the video of Living Mode that, we don't get any such false detection when we use the Sense2GoL Board. The approaching and departing motion of the person moving towards and away from the radar is detected correctly to turn on and turn off the light. Have a look at the video below to see a demo of the Living Mode. A mode of operation which can be used when you are not at house and would like to receive alerts on your phone when someone breaks into your house. The surveillance mode is similar to the cabin mode, whereas it sends a push notification to your mobile phone giving intruder alert instead of switching on/off the lights when the open/closed door event is detected. Have a look at the video below to see a demo of the Surveillance Mode. In this mode the RGB Panel of the device can be controlled from the phone to set different colors picked from the phone to give mood lighting inside the room. The video also shows how the analog values from Sense2GoL board is used sense it as a proximity switch to turn on and turn off the main light of the room, you can see this feature at the start and end of the video. Have a look at the video below to see a demo of the RGB Mode. This mode of operation is similar to the Living Mode. Whereas in this case instead of turning on the main light we will be switching on the RGB panel with white LIGHT, that gives a dimmed lighting when you wake up in the middle of night to drink water or use the WC or do something else. Basically, to move around in the dark without disturbing someone else who is sleeping in the room. Have a look at the video below to see a demo of the Night Mode. You note that the device is powered using a normal USB charger / power supply. 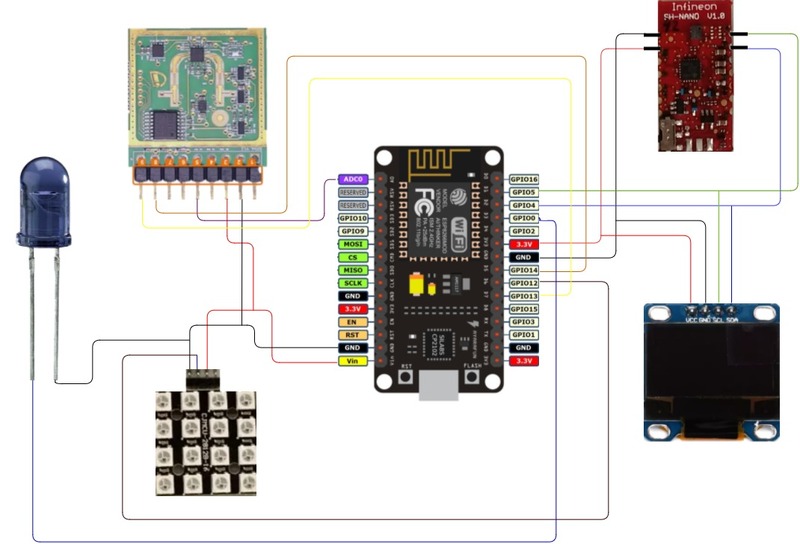 Once you have successfully added the NodeMCU board to your arduino you can get started with next steps of interfacing the sensors with NodeMCU using the schematic of this project which is given below and upload the final code to test the project as well. so using this HIGH and LOW levels of the OUT1 and OUT2 pins. Connecting them to NodeMCU's input pins we can sense the detection and direction of movement to write code on NodeMCU using Arduino IDE to perform different operations. Similarly you may connect the IF_I_HG pin to any analog pin of the MCU to read the analog values to use the sensor as a proximity switch which I have done in this project. Note: You may also use the analog values to calculate the speed at which someone is approaching or departing towards the radar using FFT algorithm. I will not be discussing this in this project as the processing of FFT needs a faster processor like the Arduino Due or Zero or MKR1000. So, I will be posting that as a separate project using the MKR1000 which I have already tested and compared with speed shown by the Micrium GUI when we use the test code uploaded on the XMC1302. There is a arduino library available for DPS310 which is available at https://github.com/Infineon/DPS310-Pressure-Sensor provided by Infineon. But this existing library doesn't work with ESP8266. So I have modified this library to make it work with ESP8266 using Software I2C using Slow Soft I2C Library. The modified library works with ESP8266 and Arduino MKR1000 as far as I have tested it for interfacing the DPS310 via I2C. You will have to download the Slow Soft Wire and Master Libraries also to use the modified library, because the modified library is using these two libraries for getting data from the sensor via I2C. Interfacing IR blaster with ESP8266 is very simple, a lot of resources are available online for reference. In my case I got NEC codes to control my IR based AC Switches I used them to control the Light and Fan in the demo videos shown, you may modify the code as per your decoded signals to test it. The RGB Panel used in this project contains WS2812B which is same as the neopixel explained very well by Adafruit Community. Picture below shows the bread board prototype of this project. Note that the OLED display is not shown the picture below as it was added at the end of the project directly on the PCB board to make the device a much useful one to be kept on the desk. Note: I have used a BC547 transistor to increase the IR Blaster range on this PCB. It is optional element which you may use if you wish. This is explained in the IR Interface section in the links that I have provided. You have to use the same mqtt server which you use in the App, on the device also to make them communicate with each other. Since I have explained almost all the features of the sensors and IR Blaster separately, you can see that the final code is a mixture off all that examples with MQTT connection, so I will be explaining about how I am using MQTT Library library for ESP8266 which is used to listen at send commands over particular MQTT topic mentioned in the code to listen to commands from the Android App and to Send back acknowledgements and to send intrusion alert as well as switch on AC switches which can be controlled over MQTT. The Android App publishes on topic HacksterProjectRx to send commands to device and subscribes to topic HacksterProjectTx to receive messages from the device via the MQTT to server. The smart desk clock hardware can work in a lot of other ways based on how you code the ESP8266 to use the detected sensor values. Play around with it build much more cooler use case scenarios for building future smart homes. I guess I have shared all the information needed to replicate this project. Just in case if you face any issues, you can type in on the comments section below, I will be ready to help. irsend.sendRaw(ON, sizeof(ON) / sizeof(ON), 38);  // Send a raw data at 38kHz. Thanks to Hariharan Prabhakar, Bhanu Chander, and Shivaranjani.